Should You Get the Flu Shot If You Have Asthma? I am commonly asked "Do I really need a flu shot if I have asthma? I never get the flu." My general response is "You are very lucky. Many people with asthma get the flu and end up with an exacerbation or in the hospital!" If you are having a fever and feeling achy it's too late. You should talk with your doctor about the flu shot every October, but it is definitely better to get your flu shot late rather than not at all. The flu may not only make your asthma worse, but it may also cause you to make a visit to the ER, end up in the hospital or worse. But, It does not have to be that way! Getting a flu shot may prevent all of these complications. However, the Centers for Disease Control and Prevention reports that only 1 in 3 adult asthmatics and 1 in 5 asthmatics under the age of 50 get their annual flu vaccination. Anyone with asthma over the age of 6 months should get a flu shot every year according to the Centers for Disease Control (CDC) in Atlanta. Why Do Asthmatics Avoid The Flu Vaccination? Despite the recommendation for flu vaccination, many asthmatics still do not get flu shots. Even when I recommend the vaccinations in clinic and spend several minutes discussing why I think it is important, a number of asthmatics still decline the flu vaccine. Based on some of my patient's responses, you would think that I was proposing that they be started on a daily injection like insulin or a major surgical procedure open heart surgery. Even when I point out to patients that many of their medications (e.g. statins to prevent heart disease, high blood pressure meds to prevent stroke, or aspirin to prevent heart attack) are prescribed to prevent future illness, they still refuse. I don't get sick: While you might not have gotten sick last year, the CDC estimates the flu sends 225,000 people to the hospital and causes death in 35,000. Just because you did not get sick last year doesn't mean you won't get sick this year. The best time to get the flu vaccine is October or November and it takes about 2 weeks for you to develop full immunity. I got sick from the vaccine: While there is a small chance people may develop some flu symptoms from the nasal flu vaccine because it is made from a live, weakened flu virus, the flu shot is made from a killed virus, so it cannot cause the flu. Importantly, the nasal vaccines are not FDA approved for patients with asthma and the nasal flu vaccine is not widely used following reports it was less effective. Taking acetaminophen or ibuprofen around the time of your flu shot can help prevent any reactions from the flu vaccine. Asthma patients are no more likely to experience side effects from the flu vaccine compared to those without asthma. I am scared of the side effects: Side effects are normally minor and include soreness or redness at the injection site, achiness, or a low-grade fever. People rarely develop a serious allergic reaction to the flu shot. And even more rarely, about one out of every 1 million people vaccinated may develop Guillain-Barre syndrome – a neurological disorder – as a complication. On the other hand, asthmatics who contract the flu are more likely to get pneumonia, an infection of the lungs, and experience severe breathing problems. Overall, because the risks of serious complications from the vaccine are so low and the risk of hospitalization and infection among high-risk individuals without vaccination are significant, the benefits of vaccination appear to outweigh the risks. If I get the flu, I'll take the medicine: Typically, flu treatments only decrease flu symptoms by about one day and may not prevent more serious complications. The government asked everyone to get vaccinated and then people died. While I do not think I have any more conspiracy theorists than the internist next door, I hear this every year from an older patient in clinic. I assume they are referring to 1976 when there was a tremendous concern over a potential swine flu epidemic. Nearly 25% of the U.S. Population was vaccinated over 10 weeks before the program was halted due to 500 cases of Guillain Barre syndrome and 25 deaths. The predicted epidemic never materialized and many thought the episode was a government sham. I develop natural immunity. While this is technically a true statement (and yes I tell my patient's this), natural immunity to flu only lasts a few months. As a result, you do not have immunity in the next flu year and the virus can be different from year to year. I got the vaccine but still got sick. Some people who exercise and eat right still develop heart disease or diabetes. In the case of the flu, you are just one of the unlucky people who got the flu after getting vaccinated. It costs too much or I don't like going to the doctor. 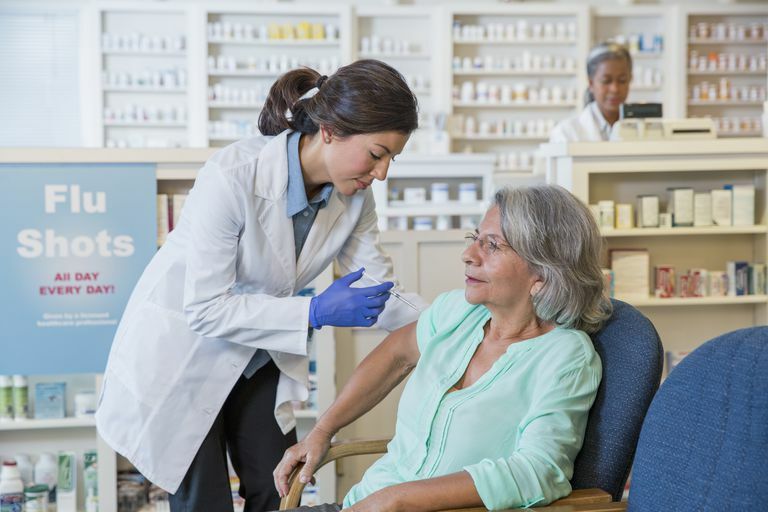 Most insurance plans will cover your flu vaccination. If not Google flu shot + "your city." Chances are that you can find a clinic, pharmacy, or hospital that is either giving them away for free or charging a minimal fee like $10. This is also a solution if you don't like going to your doctor's office. Consider getting the flu shot – it's a whole lot easier than getting the flu! Asthma and Flu Shots. CDC. Shari Roan. Swine flu 'debacle' of 1976 is recalled. What Does It Take to Become a Pulmonologist? Is It a Cold or Flu? You Need to Know. Does Having a Primary Care Physician Matter to Your Asthma?